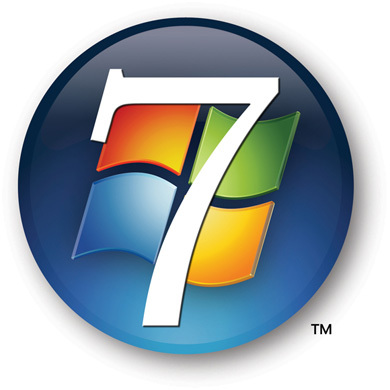 As we know Windows 7 is now become one of the most usage and successful windows after Windows XP. Everybody is now thinking When Will Windows 7 Overtake Windows XP ? And people are now really considering Windows 7 as compare to windows xp in many ways. I have noticed very strong evidence that Windows 7 has succeeded in a big way among early adopters and enthusiasts, who dominate the readership of a website like this one. I also see clear indications that businesses are adopting Windows 7 at a faster pace than in earlier Windows versions. 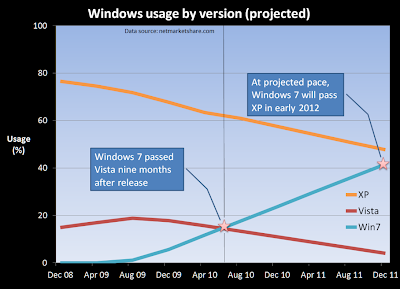 Yes, you can make a case for a hockey-stick growth curve with even a slight increase in the Windows 7 adoption rate. You could also argue for a slowdown, although I think that scenario is unlikely based on the overwhelmingly positive reception of Windows 7 in the market and where we are in the PC replacement cycle. The most likely scenario, in my opinion, is that the pace of migration from XP to Windows 7 will accelerate over the next two years as XP gets closer to its end-of-life date. In the Net Market Share data, the percentage of Mac OS X use has remained in a very narrow range for that entire period. In December 2008, the total for Mac Intel and Mac OS was 4.45%. For July 2010, the Net Market Share report breaks usage by OS X version rather than hardware platform, but the total for OS X 10.6 and 10.5 is nearly identical at 4.42%. In between, the percentage of users never rose above 4.45% and never dropped below 4%. As someone who’s watched every Windows release since the early 1990s, I find it remarkable that Windows 7 usage has overtaken Vista so quickly, roughly nine months after it was released. NetMarketShare noted that trend with its July 2010 report. That same crossover appears in the ZDNet visitor data I posted yesterday, except that it happened about 8-10 months earlier. If the broad PC market is still lagging early adopters by that same gap, then I expect Net Applications will report that Windows 7 has passed XP in usage sometime next summer.